35 years’ worth of Politbarometer data show that partisan dealignment in Germany has slowed down considerably over the last decade. One reason for this is the increase in average levels of formal education: Somewhat counterintuitively, formal education is now positively linked to partisanship. The other reason is demographic change. To the average German, demographic change is something that will happen in some unpleasant but distant future, preferably to someone else. But the nasty thing about demographic processes is that they are sneaky, slow-running beasts. In Germany, demographic change got underway some 40+ years ago, and its impact is slowly becoming visible. In my age cohort, there were always too many of us. When I entered secondary school, I was slotted into one of four ridiculously oversized parallel classes of 35+ kids each. When I enrolled in university, it was deemed perfectly normal that I should spend a whole day with hundreds of others in an overcrowded lecture theatre, waiting to be called forward. In between were twenty months of national service which turned into a two year gap in my education, because Germany could not accommodate all those young draft dodgers, and I actually had to wait four months for the privilege to start my spell. But the reason for my class in secondary being ridiculously oversized was that ours was the first year that they went down to four parallel classes from five. Aggregate fertility feel dramatically in the early 1970s and has never recovered, while life expectancy has edged upwards. Surveys may tell us that Germans are by and large blissfully unaware of these trends, but demographic change is actually visible in the surveys. During the first five years of the Politbarometer series (1977-81), 29 per cent of all respondents were under 35, while 26 per cent of those interviewed were older than 60. For the 2008-2012 period, this balance has been reversed. Voters aged 35 to 59 currently make up 52 per cent of the sample, but their share is now peaking, while the oldest group is rapidly growing and already stands at 33 per cent in the 2012 data. My little model of partisanship in Western Germany over time shows that even when education is controlled for, age plays an interesting role. It did not matter much in the late 1970s and early 1980s but quickly became a factor over the course of this decade. Younger respondents (the solid line) were increasingly less likely than their older compatriots to report an identification with a party. Relevant segments of the new cohorts entering the political system either never acquired such an identification or did not retain it at the same rate as their predecessors. Given how steep the estimated decline of their partisanship is compared to the other groups, it seems safe to assume that the dealignment of the 1980s and mid-1990s that reduced the number of partisans by nearly a quarter must have been driven largely by this group. However, once more the estimated attrition rate in this group began to fall appreciably around the turn of the century. 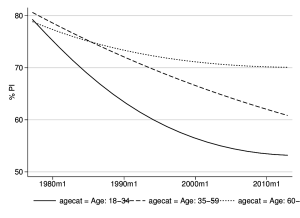 Moreover, nearly everyone who belonged to this group in the 1980s had now moved on to the next age band (the dashed line), which exhibits a nearly linear pattern of decline that is currently steeper than that of the youngest group, although levels of partisanship are still noticeably higher. Finally, the over sixties (the dotted line), who began at roughly the same level as the middle age group, did outstrip them in terms of partisans by the mid-1990s. Levels of partisanship have been essentially stable in this group for more than a decade now. Once more one must keep in mind that by the early 2000s, everyone who was in the middle group in the 1980s had moved on to this upper age band. Demographic changes imply that the mean age of people belonging to an age group will somewhat fluctuate over time: From the 1940s until the mid-1960s, almost every birth cohort was bigger than the one before, but since then, this pattern has been reversed. 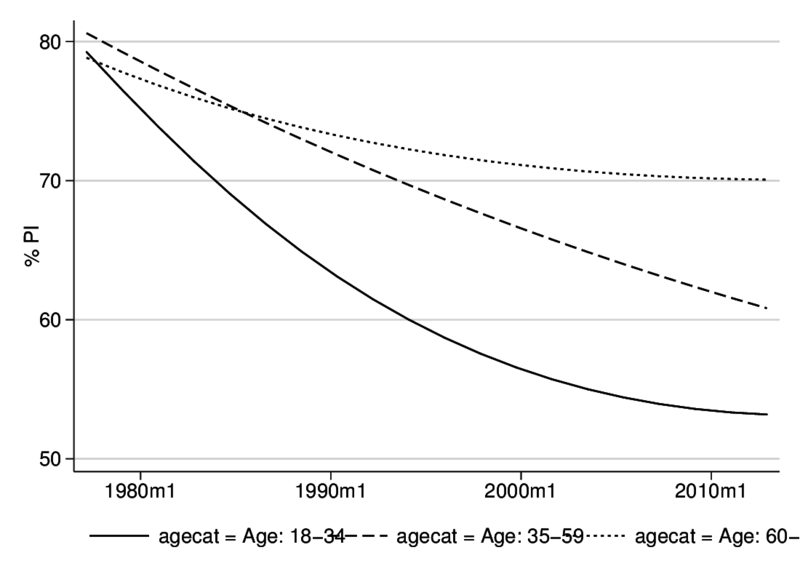 Yet, even accounting for this effect and for the rising life expectancy, the changes in the impact of age on party identification are too big to be the result of stable life cycle effects. They point either at massive shift in what it means for partisanship to be young, middle-aged, or old, or, equivalently, at substantial cohort effects. And so, for the time being, demographic change is helping German parties: The younger, less partisan group is getting smaller and smaller, while the older, largely partisan group keeps growing. Does that mean that parties will (and perhaps should) court the grey vote? Possibly, but not necessarily. The proof is left as an exercise to the reader.